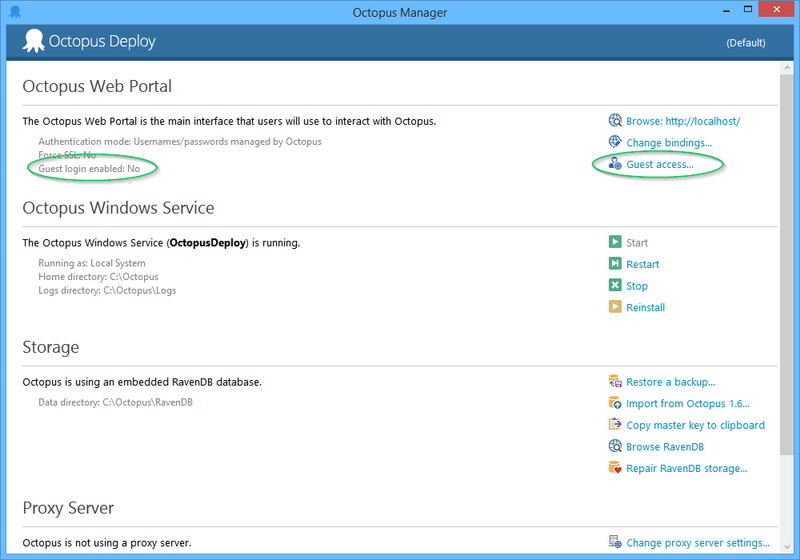 Today we've released a preview version of Octopus Deploy 2.1. Octopus 2.0 was only released a little over a week ago, and in that week I think we've managed to do quite a bit. Let's see what's new in 2.1. 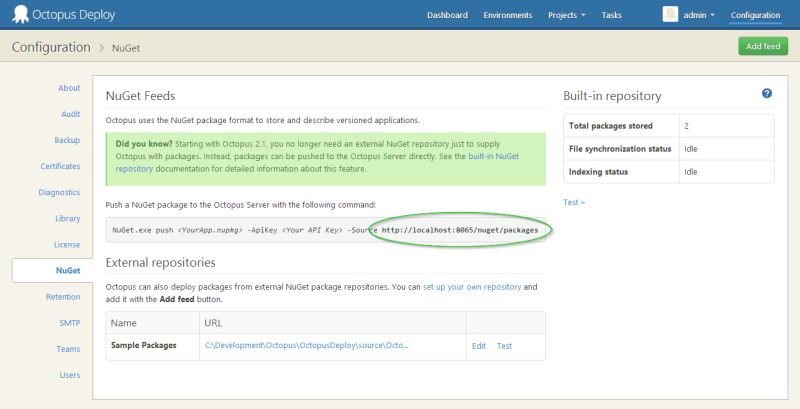 Octopus now comes with a built-in NuGet repository that you can push application packages to. The repository is based on the excellent NuGet.Lucene, making it faster option than using a file share. The repository is write-only; you can push NuGet packages to it using NuGet.exe, but you can't query it like a standard NuGet feed. Of course, you can continue to use other external NuGet package repositories; this repository just provides a nice default when you are setting up an Octopus server and don't have an existing repository that you want to use. To increase the level of accountability and transparency, the audit log now displays a diff of what changed when viewing changes to a document. For example, here we can see that it was Bob who renamed the Test environment to Staging. Naughty Bob! We had a lot of people asking for this: you can now sort and filter variables in the variable editor. Sometimes you might like to allow people to sign in to Octopus, without having a user account. We've introduced the ability to sign in as a guest. Guest users are always read-only. You can restrict what environments and projects they can view by assigning them to roles. 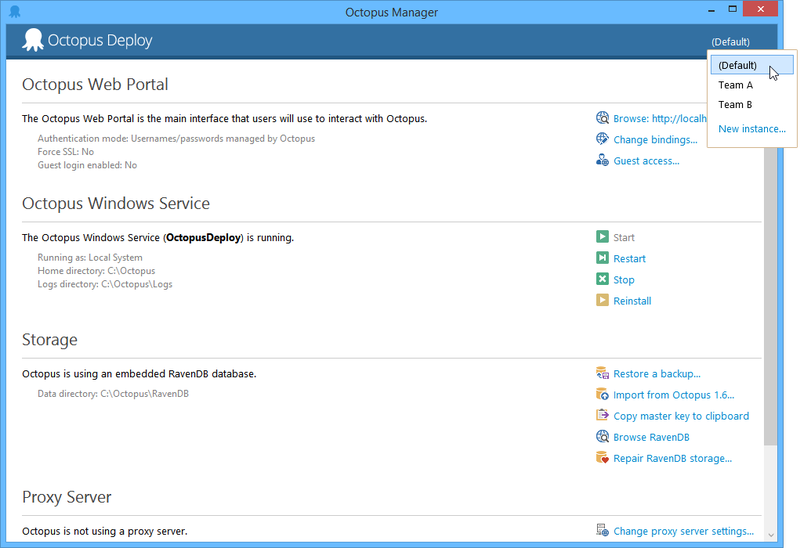 Did you know you can have multiple instances of the Octopus Server and Tentacle running on a single machine, each with their own database, configuration, Windows Service and so-on? Previously it was only possible to manage these instances via the command line, but now we're made it possible to manage instances directly from Octopus and Tentacle Manager. 2.1 also includes a lot of small bug fixes and tiny enhancements, such as the ability to clone projects. Read the full release notes to see what else changed. Happy deployments!